The 'Downwinders' From Atomic Testing Get Deserved Attention The Santa Fe Opera is inviting "downwinders," locals affected by radiation from the testing of the first atomic bombs, on stage during performances of "Dr. Atomic." 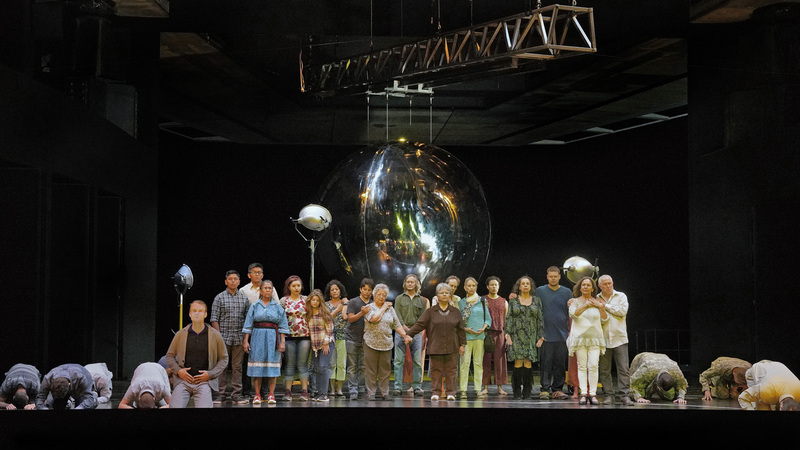 This summer, the Santa Fe Opera's staging of "Dr. Atomic" features locals who have been affected by the U.S. government's 1945 atomic bomb test. It's dress rehearsal at the Santa Fe Opera and Tina Cordova is waiting for her cue. "There is not a single one of us onstage that isn't either a cancer patient, dealing with a tumor or a cancer," she says. Cordova and the others preparing to take the stage are from southern New Mexico. They're downwinders — the people who lived near the first nuclear explosion and their descendants. Many people living in the area weren't warned before they saw the flash of the 1945 atomic bomb tested as part of the Manhattan Project. Residents of towns surrounding the site, many of them Hispanic and Native American, have never received compensation from the federal government for the harm that the bomb caused. Sixty years after the explosion, composer John Adams premiered "Dr. Atomic," his opera about physicist J. Robert Oppenheimer — director of the Los Alamos Laboratory — and the birth of the bomb. But New Mexicans were largely ignored. "No one's ever come and asked, you know, what do you think, what do you have to say about this?" says Mina Harvier. She's from Santa Clara Puebo in New Mexico, which was polluted by activity at Los Alamos, where the atomic bomb was developed. Now Harvier, like Cordova, is part of the cast of "Dr. Atomic" in Santa Fe this summer. Peter Sellars, who directed "Dr. Atomic" when it first debuted, is once again staging the show. Sellars says he's wanted to bring the performance to New Mexico ever since its premier at the San Francisco Opera in 2005. "The subsequent history of what the nuclear age has done to the world is a story that has to be told from New Mexico and through the lives of people in the state," he says. Before the opera begins, dancers from three Native American pueblos near Los Alamos perform a sacred Corn Dance for healing. As action in the opera moves to the site of the explosion, Manhattan Project Director General Leslie Groves, played by Daniel Okulitch, is indignant when the scientist Oppenheimer — the titular Dr. Atomic — suggests evacuating nearby communities. "If I have to compromise security by sending an evacuation force into nearby towns, our cover's blown," sings Groves' character. Area residents living dangerously close to the explosion site had no warning. Standing silently onstage, Cordova and the downwinders listen. Ryan McKinny plays J. Robert Oppenheimer, the director of the Los Alamos Laboratory, in the Santa Fe Opera's rendition of "Dr. Atomic." 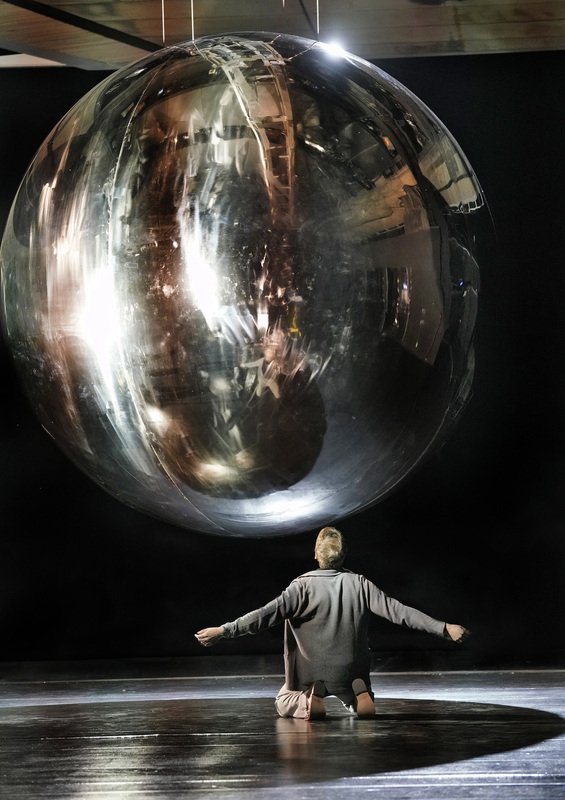 An enormous steel ball that represents the nuclear bomb looms ominously over the opera stage throughout the night. "To hear the discussion around the consideration, or the lack of consideration, that was given to us as people, as human beings — it's difficult to hear," Cordova says. Then the countdown begins. Scientists lie face down waiting for the blast, while the Native Americans and downwinders stand, staring straight ahead. "During the last scene it takes a lot to stay composed," says Cordova. "The first time that we practiced, most of us were in tears afterwards because it's a pretty intense scene." She hopes this new production of "Dr. Atomic" helps audiences realize how many people were unknowingly affected by the creation of the bomb. Last year, a study commissioned by the Tularosa Basin Downwinders Consortium — an organization that Cordova co-founded — detailed accounts of area residents living with multiple types of cancer and struggling to pay medical bills. In June, Cordova testified in front of the Senate Judiciary Committee to advocate for compensation for these individuals. "The New Mexico Downwinders are the collateral damage that resulted from the development and testing of the first atomic bomb," she said. Harvier of Santa Clara Pueblo says that despite the harm caused, her people are resilient. "We're still going to be here no matter what happens," she says. "And our tradition our songs our dances are going to live on forever." NPR's Ted Robbins edited this story for broadcast. Clare Lombardo produced this story for the Web.